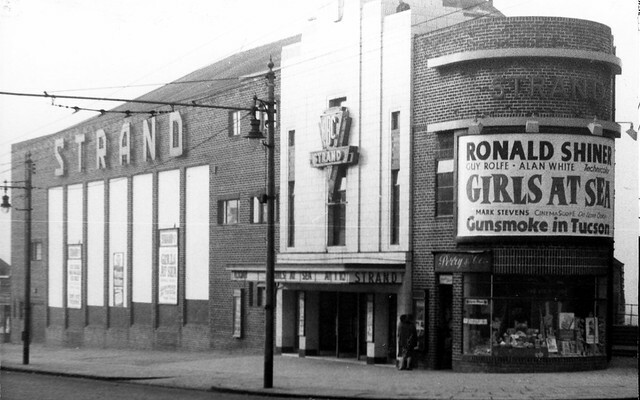 Ah Bob that was my local Picture House. Lived just down the hill from there. Is that where ye did yer courtin'? Thats right Bob, tboy says he took me there but he could,nt have made much of an impression as I have,nt a clue who he is. If it was tboy, then assume you paid? Not a chance Bob, I never had much money in those days. A much better photo than the one I have. Added a bit of colour. Bob, is that you on the roof spying on the courting couple? my mum and my aunt annie used to be the cleaners in the strand - they got 2 free passes every week - a perk of the job lol!! The Strand used to show Horror Movies after the main feature film. I think it was just at weekends. Does anyone else remember this? William, wasn't there also an exit door at the far side, near the toilets? It was only necessary for one of the lads to pay to get in. He would then head for the toilets and then lift the bar on the emergency exit, providing free entry for his mates. Great to see that old "Picture House" again. Belmont Rd so it wasn't far to walk...I was in love...but she left me for an "older" boy. Where does it all go...eh? Dirkdangler. ...thank you for your kind comments. As we get older we look back and are sometimes surprised by the strength of emotions long buried in the course of our busy lives.Our "first love" is sometimes never forgotten. A time of innocence (and pain)...very different from the realities of the"Mondo Sinistro" we discover as adults.